“I would rather have a handful of Wucha than a cartload of gold and jewels,” wrote the famous Chinese herbalist Li Shi-Chen, in his 1596 treatise on herbal medicine Ben Cao Gang Mu. First discussed as a valuable medicine over 2,000 years ago in the herbal treatise The Divine Husbandman’s Classic of the Materia Medica, Wucha refers to the roots of Eletherococcus senticosus, a plant which grows wild in abundance in the Xiaoxinganling Mountains of Heilongjiang Province. In the United States, Wucha is commonly sold as "Siberian ginseng," though it not a true ginseng species. Though the plant does belong to the same family, Araliaceae. Wucha owes its popular Siberian ginseng name to its ginseng-like properties and effects. Legislation passed in the US now prohibits Wucha, or “Elethero” from being labeled Siberian ginseng. Despite the confusion over its name, Wucha, or Siberian Ginseng, or Eleutherococcus senticosus, is an extraordinary herb that strengthens the body, enhances performance, and gives a tremendous boost to sexual vigor and function. A shrub that grows as high as nine feet, Eleutherococcus senticosus reaches maturity in seven or more years. The plant grows throughout northeast Asia, in parts of Russia, China, Korea and Japan, but is most abundant in Heilongjiang, where it is common undergrowth in forests, and sometimes grows in great, impenetrable thickets. 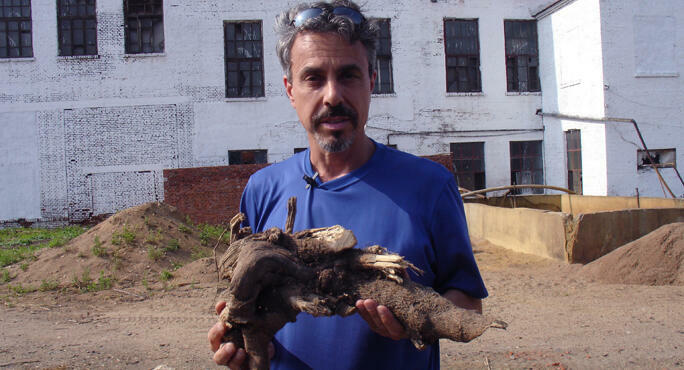 The plant yields a woody root that is one of the all-time most highly prized medicinal plants in the vast Chinese herbal pharmacopoeia. Employed in Traditional Chinese Medicine to invigorate sexual function, boost vital energy and normalize overall body functions, Wucha is classified as an adaptogen, enhancing immunity and vitality overall. It is considered an exceptionally valuable tonic with broad uses and benefits. Scientists in China as well as in Russia have found numerous active substances in wucha, including sterols, coumarins, flavonoids and polysaccharides. Some of the specific compounds in wucha that have been isolated for research include daucosterol, syringaresinol, isofraxidin, hyperine, sesamin, friedelin and syringin. Like Rhodiola rosea, Ashwagandha and Ginseng, Wucha is classified as an adaptogen, enhancing immunity to a wide variety of adverse health influences. This effect is believed to be due to its concentration of a family of compounds known as eleutherosides, but the mechanisms by which Wucha functions as an adaptogen remain unknown. Despite the lack of a thorough understanding of wucha’s adaptogenic powers, a few things are known with respect to its specific immune-enhancing effects. Two polysaccharides in wucha display specific immune-enhancing power by promoting phagocytosis (the means by which protective cells engulf harmful microorganisms, damaged cells and foreign particles), and the promotion of protective B lymphocytes, which are protective agents manufactured by the immune system. Further studies show that wucha helps to defend the body against some bacterial and chemical toxins. Pharmacological evaluation conducted in both China and Russia on the various compounds in Wucha have determined that Wucha’s stimulation of sexual and adrenal functions is due to its various sterols; its sedative activity is attributable to coumarins; its beneficial effects upon the cardiovascular system are due to flavonoids; and its anti-tumor activity is an effect of polysaccharides. Listed in the Chinese Pharmacopoeia, Wucha is used traditionally and clinically in the treatment of cancer, leukocytopenia, hypertension, hypotension, atherosclerosis, nervous fatigue and other diseases. Studies of Wucha’s effects on human performance conducted in both Russia and China show that Wucha increases human tolerance to a broad range of stress factors, including heat, noise and increased exercise. When taken regularly, Wucha increases work output, endurance, athletic performance and mental alertness. Wucha also shows remarkable protective benefits under conditions of serious oxygen deprivation. Due to its stress -reducing and extraordinary performance-enhancing powers, Wucha is popular among factory workers, athletes, miners, soldiers, deep sea divers and others who engage in physically and mentally demanding tasks and occupations. The effect of the plant upon sexual function is almost taken for granted. In cases of sexual fatigue, wucha restores vigor. In cases of impotence, wucha restores erectile function. The root boosts desire in both men and women. It is widely used as a tonic, in tea and also in small glass ampules filled with extract. If you are taking a capsule or tablet, look for one that contains a concentrated extract of wucha. A daily dose of 500 – 1,000 milligrams should impart the benefits of the plant.